Description: Sexes similar. Paler version of American Black Duck. Unstreaked throat, green speculum bordered in black (Mallard speculum is bordered in white). Absence of white in tail. 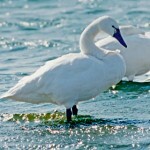 Habitat: Fresh or brackish marshes. Where in Nebraska: Accidental in the fall. Field Notes: Primarliy a Gulf Coast species. 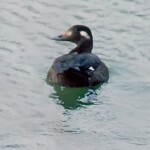 Also considered a casual migrant inland to Oklahoma and southern Kansas. 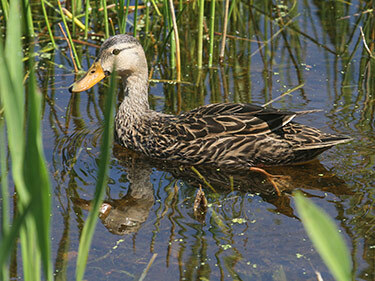 Fun Facts: Most carnivorous of all dabbling ducks. 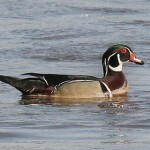 Until recently, the Mottled Duck was the only duck that nested in Southern marshes. As a result, the male adapted to look like the female, so now they both look the same. Additional Information: Considered by some to be a subspecies of the Mallard.